*Corresponding Author: Ranjeeta Soni, Sciences Department, Jagannath University Chaksu, Jaipur, Rajasthan, India. Excess availability of fluoride in drinking water is very common in India. For removal of fluoride from drinking water many adsorbents are using time to time but due to many side effects of defluoridation we need a perfect method for this. In this research work we have been applied a comparative study of two different cheap adsorbent .The using adsorbents are Fly ash and marble powder. Here used fly ash, generated from Chula. And pieces of marble collected from construction area and crushed for use in the laboratory. In this research work Ash, Marble powder is mixed with fluoridated water after filtration the fluoride was analyzed by using ions selective electrode method. After the analysis we found both of the adsorbents removes fluoride from drinking water but the results were found from Fly ash much satisfactory. Dental fluorosis: Problems related teeths. Skeletal fluorosis: Problem related bones of hands, legs and joints. Non – skeletal fluorosis: Fluoride when consumed in excess can cause several other kinds of manifestations like neurological, muscular, allergic, gastro-intestinal and urinary disorders. Table 1: Effects of fluoride concentration on human health. The treatment of water at the point of use that is, at the household level. In developed countries treatment at the source is the method adopted. DE fluoridation is carried out on a large scale under the supervision of skilled personnel, usually at a treatment works alongside other treatment processes. Cost is not then a limiting factor. The same approach may not be feasible in less developed countries, especially in rural areas, where settlements are scattered. Treatment may only be possible at a decentralized level, i.e. at the community, village or household level. Treatment at the point of use has several advantages over treatment at community level. Costs are lower, as DE fluoridation can be restricted to the demand for cooking and drinking – usually less than 25% of the total water demand. Chemical treatment of the entire water demand would lead to production of large volumes of sludge, which requires a safe disposal. It has been found that the removal of fluoride from potable water is not adequate when initial concentration of fluoride in the water is very high and the pH of the untreated water is alkaline. Moreover, different degrees of hardness of water require different concentrations of alum. Limitations of point of use treatment are that reliability of the treatment units has to be assured, and that all users should be motivated to use only the treated water for drinking and cooking when untreated water is also available in the house. The National Environment Engineering Research Institute in Nagpur, India (NEERI) has evolved an economical and simple method of DE fluoridation, which is referred to as the Nalgonda technique. The Nalgonda technique has been repeatedly proven to be an economical and effective household DE fluoridation technique. In this commonly used technique, fluoride is precipitated using 500 mg/L of alum and 30 mg/L of lime. UNICEF has worked closely with the Government and other partners in DE fluoridation programmers in India, where excessive fluoride has been known for many years to exist in groundwater. In the 1980s, UNICEF supported the Government's Technology Mission in the effort to identify and address the fluoride problem: the Government subsequently launched a massive programme, still under way, to provide fluoride-safe water in all the areas affected. These methods involve the addition of soluble chemicals to the water. Fluoride is removed either by precipitation, co-precipitation, or adsorption onto the formed precipitate. Chemicals include lime used alone or with magnesium or aluminum salts along with coagulant aids. Treatment with lime and magnesium makes the water unsuitable for drinking because of the high pH after treatment. The use of alum and a small amount of lime has been extensively studied for DE fluoridation of drinking water. The method popularly known as the Nalgonda technique(RENDWM, 1993), is one of example named after the town in India where it was first used at water works level. It involves adding lime (5% of alum), bleaching powder (optional) and alum (Al2 (SO4)3.18H2O) in sequence to the water, followed by coagulation, sedimentation and filtration (L.Iyenger, 2005). A much larger dose of alum is required for fluoride removal (150 mg/mg F-), compared with the doses used in routine water treatment. As hydrolysis of alum to aluminum hydroxide releases H+ ions, lime is added to maintain the neutral pH in the treated water. Excess lime is used to hasten sludge settling. The dose of alum and lime to be added in raw water with different fluoride concentrations and alkalinity levels (G.Karthikeyan and A. Shunmuga Sundarraj, 1999). The Nalgonda technique has been successfully used at both individual and community levels in India and other developing countries like China and Tanzania. Domestic DE fluoridation units are designed for the treatment of 40 liters of water. Whereas the fill-and-draw DE fluoridation plant can be used for small communities. Alum treatment is seldom used for DE fluoridation of drinking water in developed countries. Contact precipitation is a technique in which fluoride is removed from water through the addition of calcium and phosphate compounds. The presence of a saturated bone charcoal medium acts as a catalyst for the precipitation of fluoride either as CaF2, and/or fluorapatite. Tests at community level in Tanzania have shown promising results of high efficiency. Reliability, good water quality and low cost are reported advantages of this method (Chilton, et al., 1999). In the adsorption method, raw water is passed through a bed containing DE fluoridating material. The material retains fluoride either by physical, chemical or ion exchange mechanisms. The adsorbent gets saturated after a period of operation and requires regeneration. A wide range of materials has been tried for fluoride uptake. Bauxite, magnetite, kaolinite, serpentine, various types of clays and red mud are some of the naturally occurring materials studied. The general mechanism of fluoride uptake by these materials is the exchange of metal lattice hydroxyl or other anionic groups with fluoride. Fluoride uptake capacity can be increased by certain pre-treatments like acid washing, calcinations, etc. None of the mentioned materials generally exhibits high fluoride uptake capacities. Processed materials like activated alumina, activated carbon, bone char, defluoron-2(sulphonated coal) used for defluoridation of drinking water .And synthetic materials like ion exchange resins also have been extensively evaluated for defluoridation. Among these materials, bone char, activated alumina and calcined clays have been successfully used in the field; (Cummins, 1985, Susannae Rajchagool and Chaiyan Rajchagool, 1997, and Priyanta and Padamasiri, 1996). Area of work: Sitapura Industrial area, Tehsil Sanganer, District Jaipur (Rajasthan). Sitapura Industrial Area is located6.0 Km from Jaipur Airport along NH-12. This area is known as EPIP (Export Promotion Industrial Park). Jaipur city is 18 km from EPIP. The area is around 365.00 acres. EPIP is located in a rural-urban setting where greenery is profuse and fresh air in plenty. The water quality is potable in this area. Water availability by tube wells. The Depth of tube wells are approximate 30m. Average discharge of water is 2,000 gallons per hour. The prominent industries of in this area are chemical and automobile industries. Thousands of residential flats are available in and around area. ITI, Polytechnics, Engineering Institutes, Medical Institutes and Hospitals, Management, IT and Architectural colleges, Fashion Designing Institutes .shopping complex etc. are located in this area. 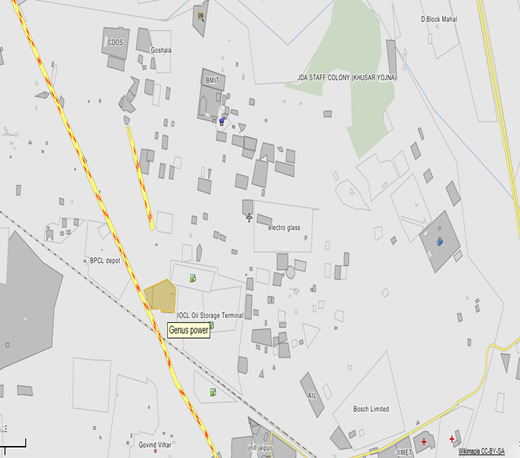 Figure 1: Map of Sitapura Industrial area. Aim of work: Due to proved health hazards, complicated procedure and expenditure, many popular DE fluoridation process like - Nalgonda, Activated alumina etc. methods are in the phase out process therefore the aim of the present research work is to find out a best DE fluoridation method which is easy to use by illiterate villagers, requires minimal expenditure, involvement of less technical personal and effective methods for fluoride removal from drinking water so that these methods can be apply easily everywhere. Importance of DE fluoridation: Due to various health impacts of fluoride on human beings the treatment of fluoride is necessary. 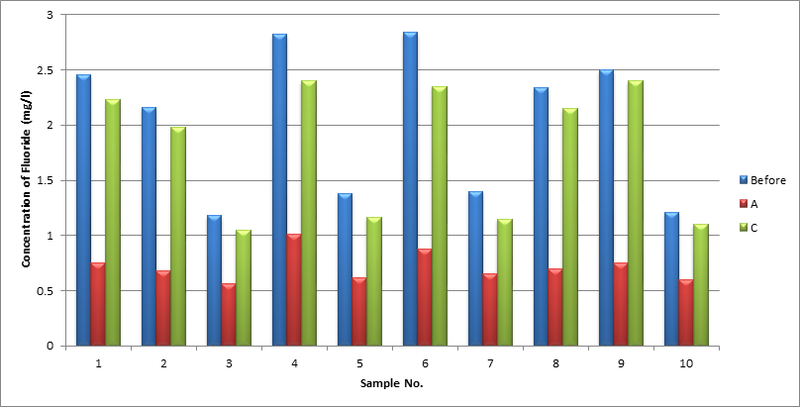 Time of sample collection- Based on the season cycle and water intake samples were collected in 3 phases. Table 2: Details of DE fluoridation methods used. In view of the demerits of some DE fluoridation methods, in the present research work we have tried to use some cheap, effective and easily available good adsorbent of fluoride for the purpose of DE fluoridation. These simple methods can be applied easily under all circumstances. Method A: Removal of fluoride by Fly Ash (based on adsorption process): -The fly ash is an effective adsorbent of fluoride .In this method we have used fly ash, generate from Chula. The 100 gm ash was mixed with 1 liter fluoridated water and stirs 5 to 10 minutes then left for settling time of 2 hr. After 2 hour this solution was filtered with G-3 crucible in a filtration unit. Method B: Removal of fluoride by Marble Powder (based on chemical treatment process): - In chemical treatment processes, lime treatment is one of them. In this method, we collected marble stone and crushed into marble powder. Then it was used for removal of fluoride in place of lime.100 gm of marble powder was mixed with1 liter fluoridated water and stir 5 to 10 minutes then left for settling time for 2 hr. After 2 hour this solution was filtered with G-3 crucible in a filtration unit. The important fluorides bearing mineral are fluoride apatite, amphiboles and micas. The concentration in ground water is limited due to the low solubility of most fluorides, but in some areas the concentration reaches above 5ppm. For the determination of fluoride we use ions selective electrode method. The ions selective electrode is fluoride sensitive electrode is of the solid state type, consisting of a lanthanum fluoride crystal; in use it forms a cell in the combination with a reference electrode, normally the calomel electrode. The crystal contacts the sample solution at the one face and an internal reference solution at the other. A potential is established by the presence of fluoride ions across the crystal which is measured by an ion meter. According to WHO, permissible limit of drinking water 1.5 mg/l. Table 3: Comparative Fluoride concentration in water samples by two different DE fluoridation methods. Figure 2: Comparative fluoride concentration before and after using Adsorbents. Table 4: Variations in Percentage (%) by two methods of DE fluoridation. To address the fluoridation problem in and around Sitapura Industrial Area, Jaipur 10 sample collection sites were undertaken for the present study. The study was conducted in three phases based on seasons and water usage. Two methods were employed on the samples for DE fluoridation in each phase. Different physical and chemical parameters along with Nitrate, Fluoride and Heavy metals were analyzed. Physical and chemical analysis like PH, Hardness, Chloride, Total Dissolve Solid (TDS), and Alkalinity has been done in the laboratory of JaganNath University, Chaksu while some parameters like Fluoride, Nitrate and Heavy metals were analyzed by Team Test Lab Sitapura, Jaipur. In phase I, all samples were collected after rainy season. During the analysis of parameters we found that sample No.6 which is collected from JNIT College has maximum fluoride concentration (2.84mg/l) and minimum fluoride concentration found in sample No.3 which is collected from Ratan Textile (1.18mg/l). We also found the fluoride concentration exceeds from the permissible limit in maximum samples collected from the study areas. When sample No. 6 was defluoridized with fly ash, the concentration of fluoride dropped from 2.84 to 0.88 mg/l. When we remove the fluoride by using fly ash method the concentration of fluoride goes down below the permissible limit. On using marble powder the fluoride concentration decreased to 2.35 mg/l. In II and III phase, again we found almost same result for all the samples as in phase I. We can see the variations of fluoride concentration in all samples of all phases before and after defluoridation methods (figure 2). The variations in percentage (%) of Fluoride content by different DE fluoridation methods in all samples are given in the Table 4. It has been observed from the percentage (%) variations, that fly ash can remove fluoride from drinking water more effectively than marble. The aim of our study was to find out the best suitable DE fluoridation methods which could be employed easily and effectively. When samples were defluoridized with fly ash the concentration of fluoride dropped drastically in all samples. But due to the chemical nature of fly ash other physico-chemical parameters showed an increase. All other parameters like TDS, Alkalinity, Hardness, Nitrate, and Chloride were controlled without hindering the ability of fly ash to defluoridize the water. No additional traces of heavy metals were detected in the samples after treatment with treated fly ash. Marble was found to be not much effectively in removal of fluoride comparative to fly ash. A. Dadhich, V.K. Sharma, H. V. Churchill, (1936). A case study of domestic defluoridation of ground water in Jaipur, India, New Kensington, Pa. Removal of fluorine from water, US Patent 2,059,553, filed Oct. 2, 1933, granted Nov. 3, (using activated alumina). A.K. Susheela, (2001). Sound planning and implementation of fluoride and fluorosis mitigation programme in an endemic village, Proceedings: International workshop on fluoride in drinking water: Strategies, management and mitigation, Bhopal, p. 1-12. A.K. Susheela, (1999). Fluorosis Management Programme in India, Current Science, vol. 77. No. 10, November, p 1250-1255. A. K. Susheela, (1993). Prevention and Control of Fluorosis, Vol. II – Health Aspects, Rajiv Gandhi National Drinking Water Mission, Govt. of India. A.K. Susheela, (1992). Defluoridation of drinking water merits of alternative technologies. A.K. Vaish, and K.C. Gyani, (2001). Management of fluoride contaminated dirking water: A successful approach of Defluoridated at domestic level in Dungarpur District of Rajasthan, Int. workshop on “Fluoride in dirking water’’ organized by Govt. of Madhyapradesh at Bhopal, 22-24 Jan p 71-74. A.K. Vaish & P. Vaish, (1997). A Case Study of Fluorosis Mitigation in Dungarpur District, Rajasthan, India, 3rd international workshop on fluorosis prevention and defluoridation of water. p97-104. Anurag Tewari, Ashutosh Dubey. (2009). “Defluoridation of Drinking Water: Efficacy and Need”, Journal of Chemical and Pharmaceutical Research 1 (1):31-37. A report on fluorosis by State Institute of Health and Family Welfare, Jaipur (SIHFW), 2008. A.N. Deshmukh, P.M. Wadaskar, and D.B. Malpe, (1995). Fluorine in environment: A review Gondwana Geol. Mag., 9: 1-20. A.V. Jamode, V. S Sapkal, V. S Jamode. (2004). Defluoridation of water using inexpensive adsorbents, received on February 16, 2004, revised September 24. APHA, 1985 Standard methods for examination of water and wastewater, American Public Health Association, Washington DC. Bekele Abaire, Feleke Zewge & Messele Endalew, (2009). Water sanitation and hygiene: sustainable development and multisectroal approaches Operational experiences on small scale community defluoridation systems, 34th WEDC International Conference, Addis Ababa, Ethiopia. Bina Rani, (2006). Fluoride and fluorosis in Rajasthan: An Overview, A project Report [IGNOU], ND, DNHE. Debasis Goswami and Arabinda Das. (2006) Removal of fluoride from drinking water using modified fly ash adsorband, Journal of Scientific and Industrial Research,vol. 65, January pp 77-79. Lela Iyenger, Defluoridation of water using activated alumina technology, Studies carried out at IIT Kanpur, A report prepared in March 2005 for UNICEF, New Delhi, Pages1-9, (Accessed on 2011 Jan. 4th). Lela Iyenger, RK Daw, Domestic Defluoridation for Drinking Water using Activated Alumina, Proceedings of the National Workshop on Control and Mitigation of Excess Fluoride in Drinking Water, 5-7 February 2004, Jaipur, Rajasthan, India, pp. T2 1-6. Citation: Ranjeeta Soni. (2019). A Comparative Study of Using Fly Ash and Marble Powder for Fluoride Treatment. Archives of Chemistry and Chemical Engineering 1(1). Copyright: © 2019 Ranjeeta Soni. This is an open-access article distributed under the terms of the Creative Commons Attribution License, which permits unrestricted use, distribution, and reproduction in any medium, provided the original author and source are credited.